Over a decade ago we were preaching “content is king” – long before the field of content marketing was an actual thing. Sure good design, great page layout, and mobile friendly design are important. But it’s great content – and the presentation of that content – that ultimately sells your business. The answer? Sometimes – but not always! It’s a commonly perpetuated myth that users don’t want to read; that all website pages should be short and visual with little copy. Instead, we are finding that website visitors will consistently spend a good deal of time reading long and in-depth articles if the topic interests them or meets a specific need. Long-form content, or articles over 1,000 words, are making a strong comeback – largely as a result of the mobile explosion. Users no longer prefer to click around to other pages or navigate through a series; they want to get all the information available with one click. Not all of your website copy should be treated the same. Here’s a glimpse into how to take a strategic approach to planning your website copy. 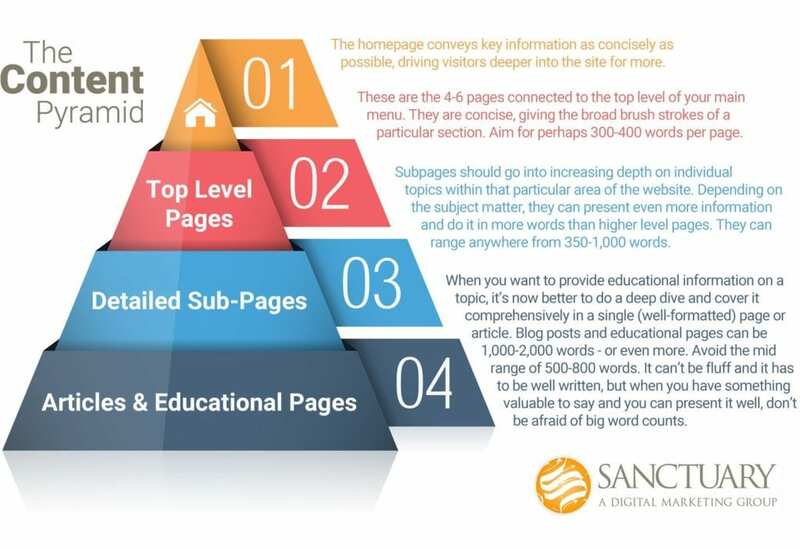 A helpful picture for planning your website content is to think of it as a pyramid. At the top you have the least amount of information, as you go down a level it grows, and at the bottom it is most expansive. The key approach to remember here is that you provide bite-sized chunks on the main pages of your website – a sampling of what is available and important – and use it to entice readers further into the site. The deeper you go, the more specific detail and in-depth information you give on individual topics. And if you have plenty to say that is valuable to a customer, don’t be afraid to use as many words as are necessary to do it as you get deeper into the site. These high quality, descriptive, detailed, deep pages are great for searchers who have specific questions and often want to learn all they can – without having to make a phone call. No matter the approach, poorly written or formatted copy will kill a visit no matter how few or many words it contains. Here are three best practices you need to keep in mind that apply to all the pages of your site. When it comes to developing best practices for copy and search optimization, what Google says is generally what goes. And for good reasons: Google owns the search market, and in the vast majority of cases the largest single source of traffic to your website is Google. Google is clear that each page of your website should have a minimum of 250 words of unique copy (so not counting header, footer, or sidebar material). If it doesn’t make that minimum, it will be held back in the search results. Good formatting is key on short pages and long-form articles alike. Need an example? Follow how this post is formatted! Every page of your website should be well-written, unique, and convey important information, key messaging points, benefits and differentiators, calls to action and your unique personality. Cookie-cutter or typo-ridden pages waste your time and your visitor’s time. And ultimately they drive potential customers away. Website content that converts visitors into customers requires strategy, not just well-written copy. And it certainly requires more than simply copying and pasting from a brochure or other materials. Want to get started with a strategic plan for how you write and present your business through website content? Contact Sanctuary Marketing Group today for a free assessment. Our team of strategists and writers will help you develop a content plan that grows your business.